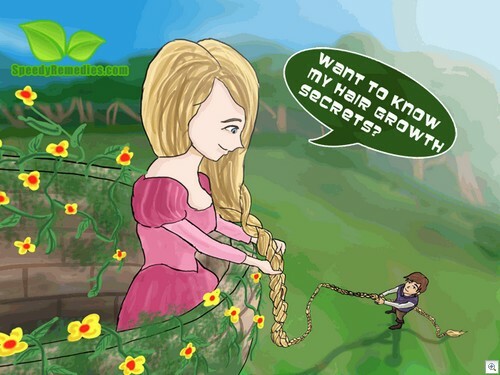 Nevertheless, you can help your hair grow faster by taking a nutritious diet and taking good care of your hair. For example, if you have oily and greasy hair, then avoid washing your hair daily because it over stimulates the sebaceous glands. Furthermore, regular washing strips the oil from the roots, thereby making them dry and brittle. Still, greasy hair needs to be washed more frequently than dry hair. Thick, long, and curly hair, in particular, need not be washed every day. Those who cannot help shampoo daily can first apply conditioner to the ends and mid-section but away from the roots and then use a mild shampoo with more emphasis on the roots as it shall reach the ends while rinsing. It has been observed that generally, strands of hair grow at a rate of about 0.3 to 0.4 mm in a day. Thus, they grow almost half an inch per month, or approximately six inches in a year. Incorporate foods high in vitamins and minerals in your diet. Fruits, vegetables, seeds, and whole grains rich in vitamin B complex (B3-niacin, B5, B6, B7-biotin, B9, and B12) are particularly useful for growing hair in a healthy way.Thus, you can have soybeans, avocados, blueberries, tuna, peanuts, Brazil nuts, etc. Vitamin A, vitamin C, vitamin E, iron, zinc, magnesium, and silica, too, encourage hair growth. Include dark-green vegetables such as broccoli, kale, collard, spinach, mustard greens, green peas, and salmon, mackerel, walnuts, flaxseeds, pumpkin seeds, and so on in your diet because they contain omega-3 essential fatty acids that boost hair growth. As hair is made of protein, include high-protein food items such as milk, cheese, cottage cheese, yogurt, poultry, soy tofu, turkey, oyster, beans, and lentils in your diet.In addition, drink an adequate amount of water throughout the day to stay hydrated to sustain cell health. Needless to say, abstain from cigarette smoking and excessive alcohol intake as these unhealthy habits promote hair loss. 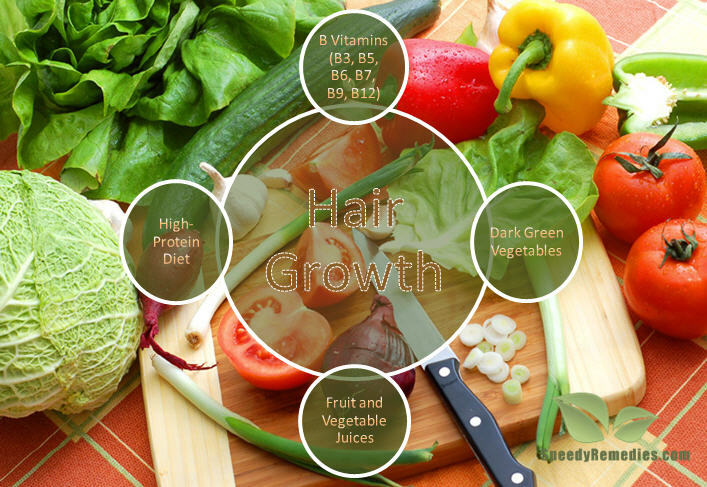 Apart from these, some other healthy foods recommended for hair growth are almonds, bell peppers, alfalfa sprouts, and oats. Drink a mixture of alfalfa juice, carrot juice, and lettuce juice. Consume beetroot juice because it is high in vitamin A, B vitamins, vitamin C, folic acid, protein, and amino acids. Another juice recipe involves extracting the juice of half small beet, half a cucumber, and five large carrots. Regularly consume a cup of yogurt mixed with one tablespoon each of wheat germ, soya lecithin, brewer’s yeast, and honey. You can include this in your breakfast. Drink freshly brewed green tea or take green tea capsules to combat hair loss. Furthermore, you may rinse your scalp with a solution prepared by steeping two green tea bags in a cup of hot water.Green tea is rich in polyphenols, particularly epigallocatechin-3-gallate (EGCG) and has anti-inflammatory properties that facilitate hair growth, and reduce hair loss. Take proper rest and sleep; it is during sleep that the growth hormone is released and the body repairs itself. In fact, sleep deprivation is one of the most common factors associated with hair loss.Hence, maintaining a good sleeping pattern not only keeps you healthy, energized, and emotionally stable, but also helps in hair growth. Yoga can prove to be of great help in making your hair grow faster and longer. Certain yogic postures can improve circulation to the scalp and hence promote hair growth naturally. Follow acupressure techniques to decrease hair loss and boost hair growth. Regular aerobic and cardiovascular exercises improve circulation, lower cortisone levels, and reduce DHT (dihydrotestosterone), thereby encouraging hair growth and protecting against hair loss. Reduce stress; it encourages hair loss. You could try meditation and relaxation techniques to manage stress. You need to eliminate both physical and emotional stress. A chemical called Capsaicin, which is present in cayenne pepper is beneficial in alleviating stress-induced hair loss.You can take about a teaspoon or a little less than a teaspoon of cayenne pepper or chili powder to promote hair growth and avoid hair loss. For convenience, you may add the powder in a glass of water or apple cider vinegar. A combination of capsaicin and soy isoflavone extract (both in oral doses) is also considered useful. However, there is need for further research in this regard.